It’s not often that a candy makes me turn to Google for a definition, but that’s what happened when I got these Woodhouse butterfly bars as a gift. I got two flavors: lemon pink peppercorn, which I could handle, and “Raz el Hanout.” I am pretty sophisticated about world cuisine, but this was unfamiliar to me. It turns out that this bar is not, say, named after a famous Middle Eastern pop singer, which was my first guess. Raz (or ras) el Hanout is a spice blend used across the Middle East. Despite years of eating various sorts of Middle Eastern food, I had never run across this flavor, so I had no preconception about how it would go with chocolate. My prejudice lay instead in my previous experience with Woodhouse Chocolates – I decided in the end that they were more pretty than they were my favorite taste experience. Would these be the same? I should say at first that they really are ridiculously pretty. 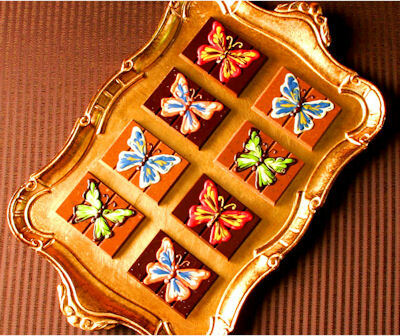 The butterflies are painted on with different colors of chocolate and what I assume is white chocolate with coloring added. And for only six dollars each, just for the appearance, this would be a great special occasion gift for the right person who likes exotic flavors and thinks it’s cool when food is insanely decorative. The flavors, though…. Lemon pink peppercorn (with dark chocolate) tastes good, if you’re into that chocolate/hot stuff combo that has become so fashionable nowadays. The problem, though, is that these are whole peppercorns. I am not so thrilled with the little crunchy bits that are left at the end of each bite. And the Raz el Hanout: This bar is milk chocolate, and along with the spice, it has currants and toasted almonds. The effect is sort of like a Chunky bar. Or a Chunky bar from another planet. Or at least another country. I can’t pin down what the spices are – apparently there are as many different ways to make the blend as there are Middle Eastern mothers and chefs – but it’s not stuff you’re used to having with chocolate. They have two other flavors that I did not get. One is candied orange peel. You probably know whether you are the kind of person who likes A) candied orange peel, and B) chocolate and orange combined, so I don’t need to tell you what to do about that one. The other is curry coconut. I would really like to try that, but they have a $20 minimum for shipping, so I don’t know if that is likely to happen. But: They have a store in a place called St Helena, California. This is the wondrous Internet – surely one of you who is reading this lives nearby. Go buy it and report back!